Naturally Moroccan dishes do not necessarily need any meat to be delicious. 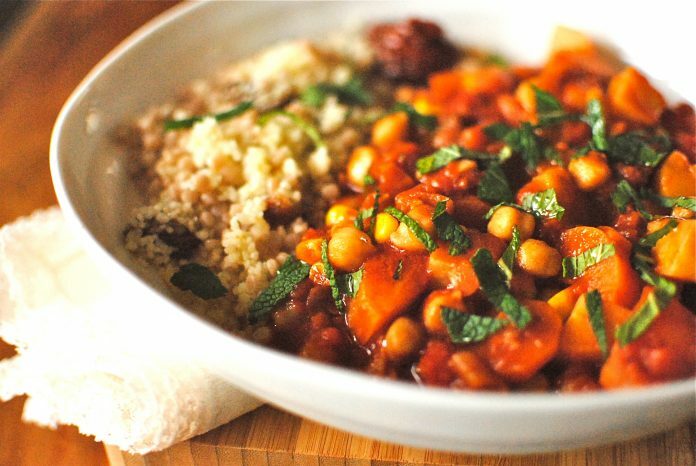 Many typical Moroccan recipes can be completely vegetarian and still taste delicious. One of the favorite Moroccan vegetarian dishes is a tajine with as a main ingredient chickpeas. This Moroccan chickpeas recipe is one of the easiest to make and has a delicious authentic Moroccan taste. Grate the onion and fry it slightly (1-2 minutes) in a deep pan (or tajine) using 2 tablespoon olive oil before mixing it with 1/8 teaspoon cayenne powder, ¼ teaspoon paprika powder and ¼ teaspoon cumin. Add the 3 tomatoes cut in small cubes, a sniff of salt and pepper, a couple of cut parsley leaves and eventually also the skinned chickpeas. Let it is simmer for 30-35 minutes on a low fire with the lid closed. Serve with either couscous or Turkish bread.